My wife drives a 2016 E350 Sedan. Took delivery mid 2015. We bought it new and it has about 25,000 miles on it, never any accidents, always garaged, dealer serviced, etc. Last week, she drives it to meet some friends, it runs perfectly. Goes to leave after about three hours and cannot open it with the remote. Uses the metal key, enters car and it is absolutely dead. Pulls out Keyless Go plug, inserts key, nothing. S.O.S. doesn't work. Called AAA, they jumped it, it started right up and she drove it about 20 miles home, put it in the garage. Ever since that event, the car has run perfectly. We have not charged the battery from an exterior source and have done nothing out of the normal since. It has probably been started, driven, stopped, about 20 times since then. We are taking it to the dealer this week for the annual service and will have them check everything, but I was wondering if anyone here has had a similar experience and what, if anything, they found to be the problem. Thanks! Last edited by Streamliner; 03-04-2019 at 03:23 PM. how long was she parked meaating here friends; i.e. how long was car off? something was left on and drained battery below 9v now did car keep it on or did she maybe accidently turn lights on? or something. Drive home after jump might be enough to charge it back up. Agree, something was draining the battery just enough so it wouldn't turn. Could be anything from hazard lights to door not being fully closed. You could always test the battery to make sure it's in good shape for piece of mind. She left it for three hours. I was wondering if anyone here has had a similar experience and what, if anything, they found to be the problem. Thanks! YES. Withing a couple of weeks after acquiring our 2016, my wife went to play pickelball with friends, and when she attempted to go home, car would not start. Doors opened with key fob, winows operated, but nothingelse inside worked. She tried and tried to start but NADA! Tried calling for her favorite mechanic (me) but no answer and she was frantic. Her friends said to call tow truck and she was about to then tried again and car started, acted normal in every way. When she got home, battery appeared to be fully charged. She was only 5 minutes from home, not nearly far enough away to allow for any serious charging. The problem? Hell if I know. Never a hint of a problem since. Either something was left on (courtesy light, headlights etc) or you have a parasitic draw on the vehicle. Also, I know it's a 2016 but check the battery life. I have seen brand new batteries take a crap. I have had several MB cars and post year 2000 they all seem to play electrical tricks from time to time that are completely foreign to normal car operation. I blame it on the systems MB uses to communicate within the car and things that happen when the car wakes up. I have had screens go dark, headlights not function, taillights not function, backup cameras go dark, Proximity sensors beep while driving, slow starts, non starts, etc. 90% of the time systems correct themselves and it's smooth sailing until the next glitch. I just chalk it up and keep driving them, as I still find them to be an incredibly comfortable car. since most of the lights are LED you would probably need all of them on to draw enough current with maybe a HVAC fan or engine cooling fan? I would on next visit to DR MB tell him the symptoms and give the old girl a check up with those computers to see if any hidden issues. Could be early sign of battery failure. Just had this happen with a Honda - car was dead and then was able to get started. Had to reset clock and enter radio code so I know it had no power. Was fine afterwards, but battery test revealed is was bad. Back when I was chasing issues with my MB AGM battery, I had it go dead once or twice and then come back to life. I would check the battery cable connections but I'm also wondering about battery. Because of the second battery for the shifter the + cable can be removed (settings still saved) to clean the terminal but don't let it touch ground or bye bye front F32 power block. Scantool should show battery voltage before starting as well as charging voltage. These are very busy cars, electronically speaking, even when sitting dormant. Last edited by Mud; 03-04-2019 at 08:11 PM. Glad you started this discussion, as it’s happening to me right now. Sitting in my car in garage at home. Car is completely dead and dark. Waiting for AAA to come jump. Going to dealer right after. My apologies for not mentioning what was done. Took the car in for service and battery was replaced under warranty. The SA said that the battery did not test out to their minimum specs. Other than that, they could find nothing wrong with the car. Hate when things "fix themselves" with no full test as you never know if that is not going to happen again. The only explanation I can think about is battery having internal bad connection. Something goes wrong and battery produce no voltage, or low voltage. You try it few times, bad connection sparks, melt the lead together and then it works just fine for long time. Possible scenario, but no way to confirm it. My SA offered this possible scenario: When my wife parked the car and went to turn it off, could she have possibly pushed the "start" button twice? This would have turned on all the electronics. If the battery was marginal at that time, this could have been enough to drain it all the way down. Oh well, it all is working fine now. This car has otherwise been bullet proof and a joy to own. Sitting at dealer now. Hope mine fails min specs and free under warranty! Lol! 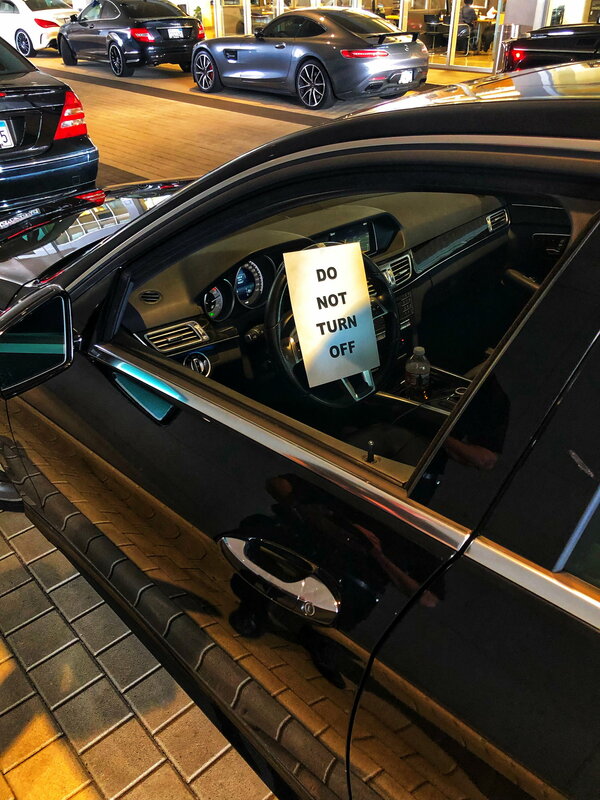 My SA offered this possible scenario: When my wife parked the car and went to turn it off, could she have possibly pushed the "start" button twice? This would have turned on all the electronics.. The option is having time -out what is few minutes (I have to time it yet) and I would assume that once the voltage drops below certain level -it would not work anyway. Modern batteries have huge capacity. I've seen Toyota left with headlights on at ski resort during our lunch break. They have been on for at least 4 hr and still going strong. Meaning it would take all headlights or maybe rear defroster to drain battery in 3hr. Last edited by kajtek1; 04-01-2019 at 03:13 PM. Got my car back just now. Dealer said they determined early failure on battery and replaced under warranty! I'm going to throw out that others have had the same problem (my wife), and there is discussion of the automatic headlight switch or driver door seat control module that can cause this. In my case, I replaced the battery (most likely culprit), but put the old one back in as it checked out fine. Car has not caused a problem again. I do keep the battery on a tender when parked, as it almost always draws a little juice (normal for the Keyless Go and other 'features'). After yesterday’s battery change... My eco stop/start seems to work like a champ! Lol! Yeah, for those of us who truly HATE the ECO On/Off System, that was the DOWNSIDE to our new battery: the system didn’t work before, but now it does. My mom had this happened with my W212. She had left the vanity mirror open and I was told that this was enough to completely drain the battery. For some reason this doesn’t allow the car to completely shut the system off, is what the dealer told me. Who knows if that’s correct or bs. I live in Phoenix AZ and we need to replace our batteries about every 2-3 years. I have an issue with my 2010 for about three years which I think is related to the light switch. Mine has the older switch which has an Off position. I used to leave it in Off as it also permitted the Auto lights feature to work. However, the battery died at 49 months (one month out of warranty), so dealer replaced it with a new M-B battery for which I paid. It had a two year warranty. I replaced it at three years and it went dead about 9 months later. Called MB Roadside Assistance and tech jumped it off as he did not have a battery on the truck - used last one that AM on another car. He said let it run for two hours and it will charge up, so I did. I contacted dealer and SM said that's baloney. Nothing wrong with battery and need to drive it for 20 miles or so to charge it. Car has to move to charge the battery. He also said to leave switch in Auto position, although he never would say why leaving it in Off was a problem. Been six months and no issues since. I do think one problem with cars today, and M-B in particular, is the huge electrical drain on them even when things are operating correctly. Also, they load cars up with all types of gadgets without really knowing what the long-term effect is going to be. Blame that on all the people who want more and more gadgets. My W212s, one with keyless go sit in garage for 2-3 weeks and never drain the battery. Somebody said they drain more when not locked, when I leave them both ways and could not notice a difference after 2 weeks. Same in the southern portion of Florida. Quick Reply: Otherwise perfect E350 goes completely DEAD! Reason?? ?